The Louisville Bats scored four runs in the first inning and held off a late Lehigh Valley rally to earn a 5-4 win over the IronPigs. Shortstop Zach Cozart was 3-4 with a home run, double, two RBI and two runs scored. Starting pitcher Sam LeCure surrendered just two runs in seven innings and struck out 13 while walking none. Former EKU infielder Neil Sellers was 1-4 in the game for Lehigh Valley. Hickory Crawdads starting pitcher Jacob Brigham held the Lexington Legends to just one run in a complete game performance to lead Hickory to a 6-1 win over Lexington. Legends right-handed pitcher Robert Donovan took the loss despite surrendering just two runs in six innings and striking out six. The Bowling Green Hot Rods tallied just six hits in a 9-0 shutout loss to Peoria. Designated hitter Gabe Cohen was 3-4 in the game. Former EKU left-handed pitcher Christian Friedrich was forced to leave his start for AA Tulsa without recording an out after being hit under the left elbow with a line drive. Friedrich surrendered two runs on four hits. Check back to BluGrass Baseball for updates of Friedrich’s condition later as he is scheduled to be re-examined today. 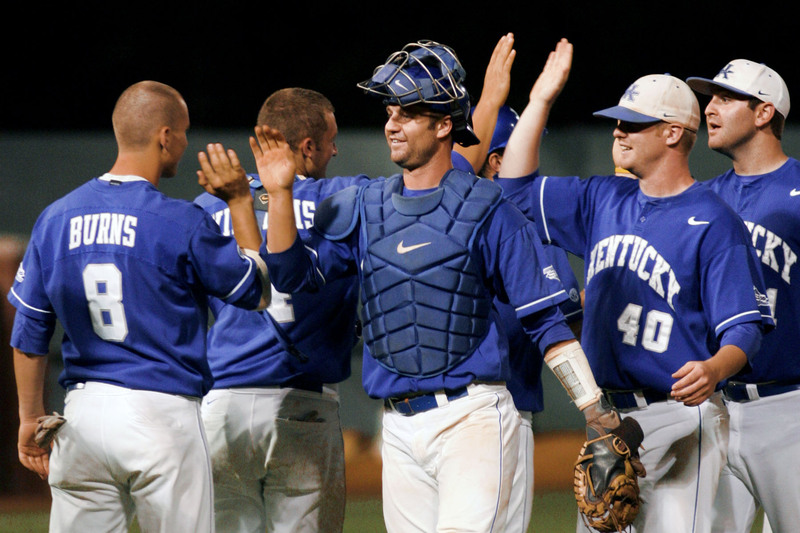 Former UK catcher and 2010 Astros NDFA Marcus Nidiffer extended his hitting streak to 11 games with a 2-6, one home run performance. Nidiffer drove in two runs and scored twice. He is batting .356 with six home runs and 13 RBI in 24 games for rookie-level Greeneville. LCA alum Robbie Ross picked up his first win for high A Bakersfield after surrendering four runs, only one of which was earned, in seven innings. Ross struck out eight and walked just one. Former UofL first baseman and 2010 Rangers draftee Andrew Clark was 3-4 with a stolen base, walk, RBI and run scored for short-season Spokane. Former UofL infielder Chris Dominguez was 2-4 with a home run, two runs scored and two RBI for high A Augusta. Former UofL right-handed pitcher Trystan Magnuson picked up his fifth save for AA New Hampshire with three scoreless innings. Former WKU outfielder Chad Cregar slugged his 11th home run of the season for low A Greensboro. Lexington native Jeremy Shelby was 3-6 with a double, RBI and run scored for rookie-level Greensboro. Trinity High School alum Tyler Kuhn slugged his third home run of the season for AA Birmingham.